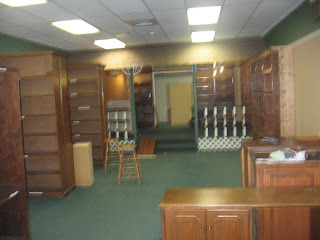 Here is an interior pic after Tif got all the books out and took down a few of the bookshelves. 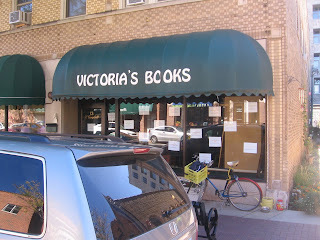 this is a shot of the front, the window letters are gone, replace by our "future home of.. signs"
I was just walking by your new store today and saw the signs. After reading your blog, I can't wait to have a new store so close by. Good luck! is that green carpet on the floor? You guys gonna tear it out? yes, it's green for now.